I recently engaged in an interesting discussion with a client about their choice of platform technology for their website and community build-out. Their current website is built in .NET and they’re getting to the point where things are about to start getting set in stone in terms of scaling and overall architecture and it kinda freaked me out that they’d continue down this path using a platform that I think offers little when it comes to organic community-building or much in the way of “doing web things right”. I decided I’d write up my arguments for switching platforms in the hopes that I might test my thinking and in the process persuade our client to move to a more community-forward platform. WordPress is my favorite blogging platform and has been for a long time. It gets the basics right and never overwhelmed me as I grew up in my blogging experience. However, like Firefox, WordPress is also eminently extensible and makes it easy to both get more out of the platform the longer you’re on it and the more plugins you add to customize your experience. Akismet: the best comment spam protection this side of dodge. It fortunately comes pre-installed, though you’ll still need an API key from WordPress.com. Clutter-Free: a simple plugin for customizing the WordPress composing interface. If you never turn off comments or worry about editing the slug, this is a handy plugin to keep things nice and tidy. Comment Timeout: I just started using this one recently when it turned out that 90% of my comment spam was showing up on older posts. This one’s a life saver. Diagnosis: this is a really useful plugin for finding out information about the server that you’re hosted on. Essential for debugging compatibility problems (like which version of PHP you’re on). FeedBurner FeedSmith: Steve Smith originally wrote this plugin to make it easy to use FeedBurner for syndicating your blog and now FeedBurner has taken over its maintenance. Super easy to use and super useful. Maintenance Mode: whenever I need to upgrade WordPress, I always flip the switch on this plugin giving my visitors a pleasant down-time message. It doesn’t come with LOLCats out of the box, but you can customize it to be if you’re feeling adventurous. TanTanNoodles Simple Spam Filter: Matt is skeptical about this plugin, but I find it useful. Essentially you can blacklist certain words and this plugin will delete any comments found to contain those words, as well as pre-filter comments as they’re being submitted. Whether it’s redundant to Akismet or not isn’t important to me — I need all the anti-spam kung fu I can get! Trackback Validator: this plugin is part of a research program out of Rice University. I don’t know how well it works, but I certainly have very little trackback spam since installing it! Subscribe To Comments: unless you’re a co.mments or coComment user, it’s often a pain to stay on top of comments you’ve left on other blogs. Subscribe To Comments adds a checkbox below your comment box to allow your readers to subscribe to comment followups via email. WordPress.com Stats: like Akismet, this is another Automattic product. If you have a WordPress.com account, this plugin will gather visitor stats on your blog and integrate them with your WordPress.com dashboard. WordPress Database Backup: this one is also pre-installed by default and is recommended as part of the routine for upgrading WordPress. Every time you increment your install, you should do a backup with this plugin. WordPress Mobile Edition: Alex comes through with another hugely useful plugin for converting your site to be mobile-phone friendly. I’m currently working on a skin for the iPhone, but for everything else, this one works wonders. Highly recommended. WordPress Reports: If the WordPress.com stats aren’t enough for you, Joe Tan has written an awesome plugin that merges your FeedBurner and Google Analytics stats into a very readable page of infographics. WordPress OpenID (+): of course if I’m going to be running multiple WordPress blogs, I’m not going to want to remember multiple usernames and passwords across them. Instead, I use OpenID. Will Norris‘ work on Alan Castonguay original plugin fixes some bugs and update the JanRain library to avoid a number of compatibility errors. WP-Cache: if you get any kind of traffic whatsoever, this plugin is a lifesaver, especially in spikes from Digg and elsewhere. Turn it off while testing but otherwise, leave it running. WP-ContactForm: Akismet Edition: I used Chip Cuccio‘s WP-ContactForm for some time but found that it was a bit too restrictive with its spam fighting tactics. I switched to this version, which uses Akismet rather than regex rules and have found that it’s a better balance for me. So there you go. That’s the list that I use for every WordPress blog that I start. I should ask: how many of these do you use? What’s your favorite list of WordPress must-adds? Oh, and bonus! I start every theme I work on with Sandbox. It’s extremely flexible, fully classed (including native support for microformats) and now there’s a contest for best skins on until the end of the summer. Definitely a must-have for any new blog I work on. Alex King has released a WordPress plugin that links your WordPress blog to your Twitter account, allowing you to pull your “tweets” into your blog or post directly to Twitter from WordPress. Among other features is a sidebar widget for latest tweets and a forthcoming digest mode. Two more announcements for OpenID adoption — but this time on the consuming side (as opposed to my originally incorrect report about WordPress.com — for now, they’re only serving as an identity provider). 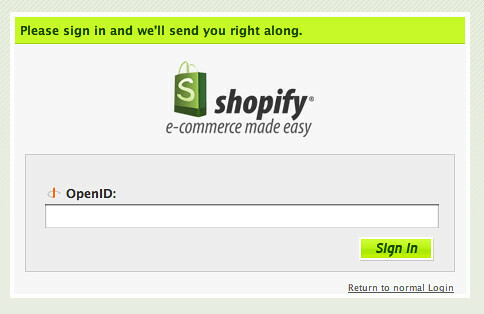 The first is Shopify, a great Rails-based custom store application. As Alex points out, these guys really get it right — and make it super easy to create compelling marketplaces. And now, it’s super easy to log in with OpenID. Meanwhile, IconBuffet has gone through a major overhaul, becoming something of a social network for … icon enthusiasts! (Sweet!) One of the more existing aspects of the relaunch (at least for me) is their use of OpenID: you can either create a new account with an existing OpenID (say, your WordPress.com blog URL) or you associate your existing account with an OpenID. Either way, they too’ve made it really easy to get going with OpenID. I imagine that these won’t be the last of the increasing deployments of OpenID in the medium- to long-tail (read: not Google or IBM, but small business community). What’s so existing about these recent additions is their proximity to commerce — and how folks like Shopify could eventually weave a web service that allows you to check out — entirely by way of logging in to your OpenID provider. If you choose a good OpenID provider, you can start to see how the CardSpace metaphor makes sense — just like when you go out to eat and depending on whether it’s a business meal or a personal expense, you’ll use a different credit card to pay. The same thing is true for OpenID — where you can have as many OpenIDs as you like and you can pick among them for different uses or purposes. It’s only a matter of time before I go to check out at IconBuffet, I login with my WordPress.com OpenID and I’m able to use credits that I’ve purchased on WordPress.com to pay for my icons — with no need to reach for the credit card, to fill in my address info or any of that ever again! Apparently mod_security is really aggressive around certain words (like in my previous post). To get around this, add SecFilterEngine off to your .htaccess file. You might not want to leave that snippet in there long, since it disables the security check, but if you find WordPress denying you the ability to post, it’s worth a shot. In celebration of the release of WordPress 2.1 and Akismet 2.0 (okay, so it’s not like a major point release, but still…) I thought I’d put out a fancy-schmancy WordPress icon for your downloading pleasure. I’ve included various size icons as well as the Photoshop and lllustrator sources, oh and a Mac icon file as well.